Instead of complaining about not having enough money, go out and hustle for it! Welcome to May! Did everyone have a good April? Our little man has been developing his motor skills very rapidly. He’s now crawling all over the place and just starting to try standing up. Daycare has been very good for him to interact with other adults and children on a daily basis. Pretty soon our boy is going to start running around. We continue to regularly make deposits into his 529 college savings account – one day he will appreciate that we set aside this fund for him to cover his higher education expenses. Side hustles help bring us extra income we can use to invest for our son’s future. Being a parent is the hardest job, but it's also the best and most rewarding job I've ever had. This past month was extremely busy for both of us. We’ve both been slammed at work and mostly feeling exhausted. Months like this make us both realize that we don’t want to work full time until we’re 65. Spending time with family and friends help us balance our work and our lives. When you’re tired, it’s difficult to make time to go to the gym. Our dog Abby helps us do a little bit of exercise daily. She goes on walks at least 3-4 times a day, 2 of them longer (~20min) and 2 of them shorter (~7 min). It feels refreshing to go for a morning run every day. I’m thankful to have my dog keep me motivated to get out of bed early and go jogging. 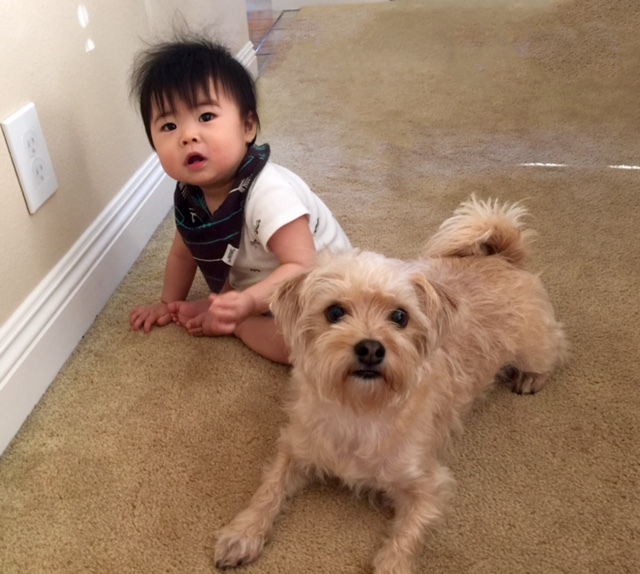 I’m also thankful that Abby gets along very well with our son, despite him trying to pull on her fur. We’ve been doing a fair amount of remodeling on our home lately. We spend a good portion of our time at home and want to keep it in good shape. We are having much of our wood exterior replaced with stucco and having our house repainted at the same time. This $8,000+ expense will freshen up our place and make our home much more durable for the future. We are on track to pay off our home in about 14 years. Since we’ve been keeping busy all month, we haven’t earned too much income on the side. Here’s our monthly summary of side income that we have generated in the previous month of April. On 4.1, I received a PayPal deposit of $60.58 from Mr. Rebates cashback shopping portal. Mr. Rebates is my main go to shopping portal for cash back on purchases made online. On 4.3, I received a $5.56 statement credit on my AMEX Premier Rewards Gold (PRG) card from AMEX Offers (5% cash back on purchases made from Home Depot $100 or more). On 4.12, I received a $20 Visa Debit card from Staples for Visa gift card purchase promotion (spend over $300 in Visa gift cards, get a $20 rebate card). On 4.12, I received $5 Amazon gift card from Pinecone Research. Each ~5 minute survey earns 300 points, and it takes 500 points to redeem for a $5 Amazon gift card. On 4.1, we received a net profit of $430 from our rental property. On 4.1, I received a check for $600 from our temporary housemate. On 4.14, my wife applied for and was approved for her own Citibank ThankYou Premier credit card! She will earn a sign up bonus of 40,000 ThankYou points after spending $3,000 within 3 months! While this deal isn’t as good as the 60,000 ThankYou point offer I received last year, it’s still nothing to scoff at. We figured that if we were going to be spending a bunch of money at once, we might as well get some bonus credit card points along the way. Our side hustle income really dropped this past month. But the beauty of side hustles is that we can always increase income if we put in more effort. We earned $1,030 from rental income. Rental income so far has been very steady and requires minimal effort. All of this totals $1,181.14 from our side hustles for the month of April. How has your past month been?